Does it keep the doctor away??? Whilst juicing an apple this morning, this little rhyme popped into my head, and it got me thinking... So I thought - it was time to investigate! Boron - This nutrient supports strong bones and a healthy brain. Pectin - Pectin is a form of soluble fiber than lowers both blood pressure and glucose levels. It can also lower the levels of the "bad" cholesterol in the body, referred to as LDL. As a source of fibre, Pectin helps maintain the health of the digestive system. Ursolic Acid - Found in the apple peel, this acid helps to keep a toned and slender body by increasing muscle growth by up to 15% and reducing body fat by half. Quercetin - A flavonoid, this nutrient shows promise for reducing the risk of various cancers, including cancers in the lungs and breast. Quercetin may also reduce free radical damage. Free radicals develop when atoms in the body's cells have unpaired electrons, which can lead to damage to different parts of the cell, including DNA. Quercetin may neutralize free radical damage, which has been implicated in a variety of age-related health problems, including Alzheimer's disease. Vitamin C - Found in lots of common fruit, Vitamin C maintain overall good health in the body by increasing immunity. 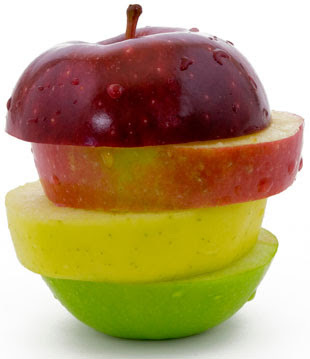 Phytonutrients - Apples are rich in a number of types of Phytonutrients, including vitamins A and E and Beta Carotene. These compounds fight damage from free radicals and can have a incredible affect on overall health and in fighting disease such as heart disease and Asthma. So the next time you much into a juicy apple, remember the helping hand you are giving your body! As one of the most commonly found, easily accessible and affordable fruits in the world, its time the apple had a little credit!